Enterprise Rent-A-Car launched recently an advertising campaign signed by The Corner and starring Gerard Butler. The TV ads prove – beyond doubt – that Enterprise can handle the most demanding car rentals imaginable. The center of the campaign is two 30-second TV adverts – Skydive and Paparazzi – which follow Gerard Butler in a series of high-intensity action sequences, including free-falling from 20 thousand feet and escaping a desperate paparazzi ambush. From today, Skydive will be seen on UK television and will run for two weeks. Paparazzi will then air from 22nd April 2019, with an extended version showing during screenings in UK cinemas nationwide. The mantra of ‘whatever the mission’ will be used across digital, out of home and Enterprise’s 470+ branches across the UK. To create the blockbuster-styled TVC, The Corner teamed up with stunt coordinator Greg Powell, whose experience includes work on The Avengers, Bond and Bourne to name a few. Skydive shows Butler leaping out of a plane and calling Enterprise to organize a convertible with the roof down for him to land in. Paparazzi, filmed over three days, depicts Butler being chased by a group of paparazzi around London, escaping in an Enterprise car. It features some of the city’s most iconic locations. It’s been great to be part of such an exciting campaign for Enterprise. It’s a fantastic, action-packed spot that was great fun to shoot. Enterprise is the biggest vehicle rental company in the UK, and we wanted to give them a big campaign to match. 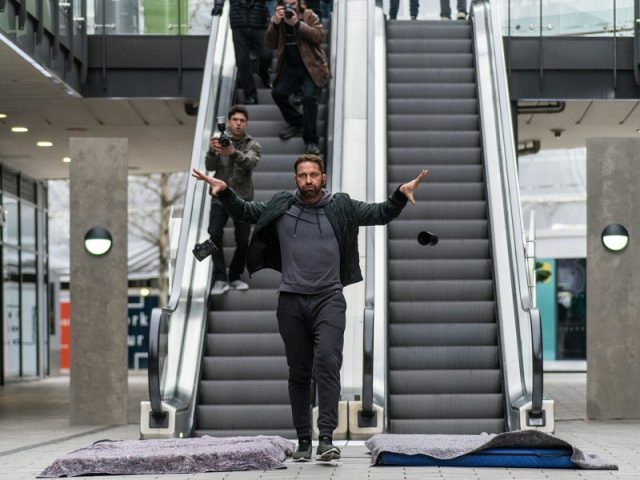 So we teamed up with some top talent in director Guy Shelmerdine, stunt-coordinator Greg Powell and of course Mr Gerard Butler himself, to bring a bit of Hollywood pizzazz to car rental. I hope people enjoy watching them as much as we did making them. We wanted to create a campaign that speaks to our ambition of being a brand that is transforming how people access and use vehicles. They illustrate how Enterprise uses the latest technologies coupled with its unique approach to customer service to make access to virtually any vehicle quick, convenient and immediate. The ‘Whatever the Mission’ series captures just how the customer is at the heart of everything we do. Our aim was to show that our business is based on the needs of our customers – whatever the vehicle, whenever they need it and however long they need it for. Our new campaign for Enterprise highlights how the brand is leading the market to provide on-demand, exceptional service to car renters. At the Corner, we create campaigns that flow from big ideas. Cue: Gerard Butler carrying out the most demanding, extreme rentals imaginable. Showing that whatever the mission, Enterprise can get you on your way. The Corner creates ‘work that matters’ – Powerful ideas that understand what the target audience want, cut through into popular culture, and make a material difference to their clients’ businesses. Founded by Neil Simpson, Tom Ewart and Neil Hourston in 2012, it was voted Global Creative Agency of the year at the PromaxBDA and is listed in the Sunday Times best 100 small companies to work for. Enterprise is part of St. Louis-based Enterprise Holdings, which also owns and operates the National Car Rental and Alamo Rent A Car brands. In its fiscal year 2018, Enterprise Holdings recorded $24.1 billion in revenue and employed 100,000 people through its network of independent regional subsidiaries. Enterprise Holdings operates more than 10,000 branches worldwide, is available in 90+ countries, and has a fleet of 2 million vehicles. In the UK, Enterprise has branches and vehicles within 10 miles of 93% of the UK population (Experian).